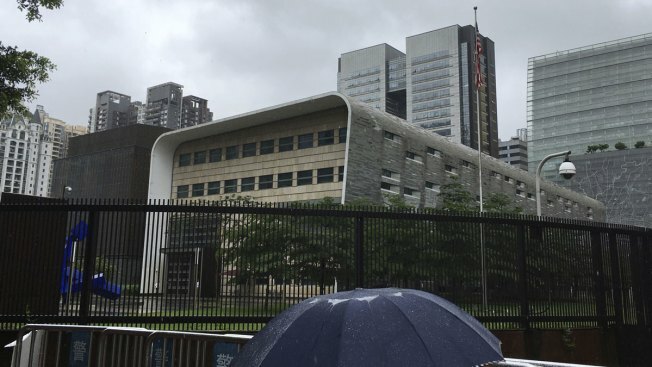 "I do not believe that our military, our diplomats around the world or here at home are safe"
This June 7, 2018, file photo shows a man carry an umbrella past the U.S. consulate building in Guangzhou in south China's Guangdong province after the United States evacuated several workers over medical testing that revealed they might have been affected by unexplained health incidents that have hurt U.S. personnel in Cuba and China. The mother of a U.S. diplomat who fell ill after suspected "health attacks" in China is speaking out, sharing her family's harrowing story with NBC News in hopes of raising awareness about the potential danger facing American diplomats and other workers around the world. Laura Hughes, an Air Force veteran, says her daughter Catherine Werner is struggling with the effects of traumatic brain injury after experiencing strange sounds and sensations at her apartment in Guangzhou, where Werner was a foreign trade officer until being medevac'd out earlier this year. "I do not believe that our military, our diplomats around the world or here at home are safe," Hughes told NBC News. "Because this weapon system is creating havoc." The Cuban and Chinese embassies in Washington did not respond to NBC News inquiries about the Werner case.